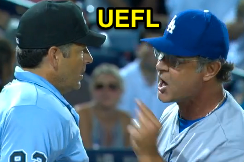 HP Umpire James Hoye ejected Dodgers Manager Don Mattingly for arguing a strike one call in the top of the 8th inning of the Dodgers-Braves game. With none out and none on, Dodgers batter Justin Turner took a 3-0 fastball from Braves pitcher Luis Avilan for a called first strike before flying out on an ensuing pitch. Replays indicate the 3-0 pitch was located off the outer edge of home plate and thigh high (px .996, pz 2.464), the call was incorrect. At the time of the ejection, the Braves were leading, 4-3. The Braves ultimately won the contest, 4-3. This is James Hoye (92)'s third ejection of 2015. James Hoye now has 5 points in the UEFL Standings (7 Previous + 2 MLB - 4 Incorrect Call = 5). Crew Chief John Hirschbeck now has 11 points in Crew Division (11 Previous + 0 Incorrect = 11). This is the 130th ejection of the 2015 MLB Regular Season. This is the 58th Manager ejection of 2015. This is the Dodgers' 7th ejection of 2015, 2nd in the NL West (SD 12; LAD 7; SF 5; COL 4; ARI 1). This is Don Mattingly's 4th ejection of 2015, 1st since May 29 (Mike Winters; QOC = Y [Balls/Strikes]). This is James Hoye's first ejection since June 3, 2015 (Dan Jennings; QOC = N-C [Check Swing]).